Take your Italian to the next level! Learning Italian is definitely worth it! It is spoken by over 85 million people worldwide! Think about how many new people can you meet and speak to them in their native language? Also, Italian is the official language of classical music! Imagine listening to Nessun Dorma and understanding each word perfectly! Should we mention the brilliant Italian literature we inherited? Do you want to read The Divine Comedy in original? Learning Italian online with VocApp will make all of these goals achievable! Why is VocApp the best platform to learn Italian? Our online Italian courses include the most common Italian words that you will need in order to start a conversation in Italian! The flashcards we've prepared will teach you the Italian grammar and pronunciation. You can download the Italian courses as MP3 files and use them as Italian audio lessons to learn on the go! They include the Italian to English translation so you understand the meaning of each word and are able to use it properly. This and many more special features were prepared for you to learn Italian fast and easy. What are you waiting for? The most used Italian adjectives in one course! An Italian adjective is an important part of a sentence. Learning popular adjectives in Italian helps you express yourself in a more interesting and colorful way. The Italian adjectives list of this course includes all of the most needed and vital Italian words that you have to know in order to participate in conversations and describe things precisely. It's enough to make a 5-minute effort daily and soon you will see that you remembered many of the new words and are able to use them. Don't forget to learn with our other courses, for example Italian Words: Top 500 Verbs and Italian Words: Top 1000 Nouns. This way you will enhance your Italian vocabulary and speaking Italian will become easier! 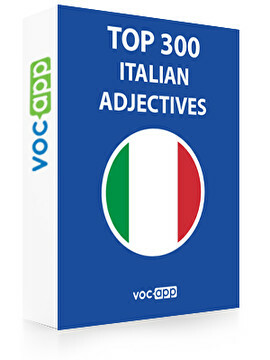 Start learning Italian with VocApp and be impressed with your fast results!